You may have heard stories of brilliant software engineers jotting down code on bar napkins when they have a sudden epiphany while drinking with their friends. Maybe you've done this sort of thing yourself. 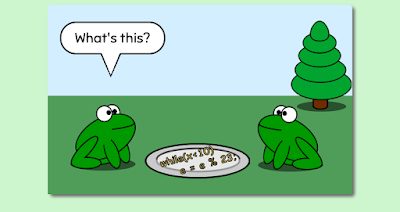 Maybe, like the frogs in today's comic, you've written down code in a stranger place. I've never written code with letter-shaped pasta, but I have written out lots of algorithms on paper beside my keyboard. It's never in perfect form for compilation, but is usually just pseudocode. I am not a genius when it comes to algorithms; I can rarely go straight from my brain to they keyboard and have the code work on the first (or fifty-first) try. When I was working on the match-3 game back in January, it took lots of scratch paper pseudocode to get things working correctly. For whatever reason, writing out the algorithm in pencil and then working through it on paper really works for me. I usually write a list of the variables off to the side, along with their current values as I work through the steps. I erase and re-write the value of each variable as it changes. This is a skill I was taught in college, using a whiteboard instead of paper, but it works just as well. If you haven't done something similar yourself, give it a try next time you're stumped on an algorithm problem. Or just take a break from programming and read some of my comics!